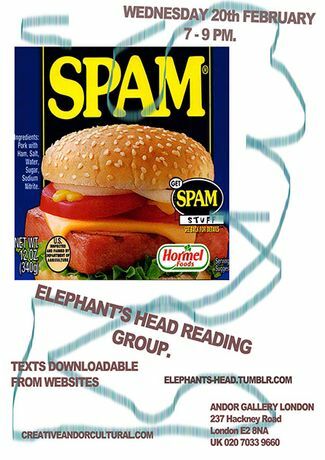 The Elephant's Head are conducting a series of reading group events chatting SPAM, conversing and sampling some OFFICE cooking. Texts to be read this Wednesday: (1). NOTES ON THE INORGANIC, PART I: ACCELERATIONS - GEAN MORENO, E-FLUX JOURNAL 31 http://www.e-flux.com/journal/notes-on-the-inorganic-part-i-accelerations/ (2). THE THIRD INTERVAL - TAKEN FROM PAUL VIRILLIO'S OPEN SKY https://www.dropbox.com/sh/carrgq2nivkfer9/79DI5pB8sn Bring along a text or book if you fancy!